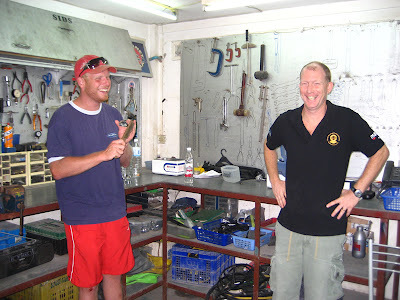 Gideon and Simon kicked off the IDC related courses for 2008. Yesterday they both completed the Nitrox courses, a prerequisite for the DSAT Gas Blender course, which they completed today. 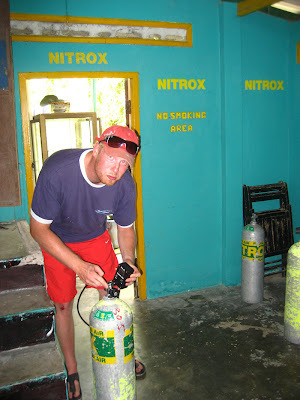 Gideon, currently a PADI Divemaster who's working as such on the Samui boats and waters, is using the Nitrox tanks for his work out!Gideon is participating in a Rescue Diver to Go Pro CDC package. 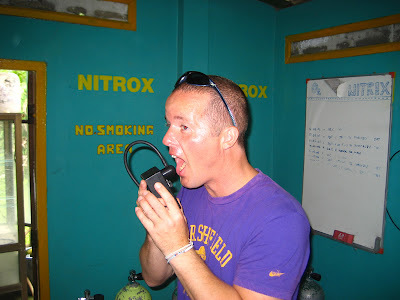 He somehow mistook the gas analyzer as a breath analyzer! He was cleared to continue the course however. Simon, who just got signed off as a brand new PADI Divemaster, is cleaning a piece of equipment as part of the cleaning work shop for the Gas Blender course. He knows a good story or two! 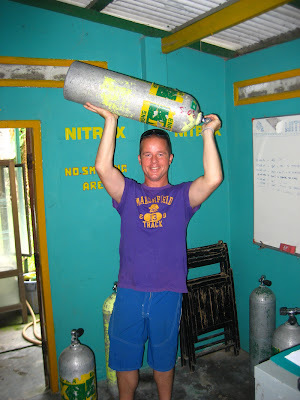 Simon analyzing a Nitrox tank as part of his Gas Blending course. Simon is participating in an Advanced Open Water to Go Pro CDC package. Both Gideon and Simon will be participating in the IDC starting 28th January. It looks like this will be a bigger one, with 8 confirmed candidates at this moment and both of them will be nearing the end of their respective packages. Well done so far. Gideon is also keeping track of his adventures and courses in his blog.